For Becca Rice, it took some dedicated athletes and three years at the helm to rebuild Greencastle field hockey. When Becca Rice took over the Greencastle-Antrim field hockey team in 2014, the Blue Devils were fresh off a 2-14-1 season, eager for a rebuild to get back to past success. Under usual circumstances, Rice would have been in for a few more "rebuilding years" before the program got back to its prime. But Rice is anything but usual. Her coaching philosophy is clear. 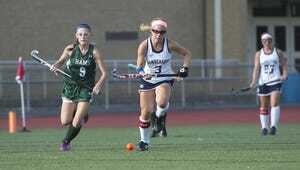 Field hockey is a full-time sport. Dedication, respect and heart go a long way on Rice's field, but that's only step one to rebuilding a program. Thankfully for Rice, the team bought into her new coaching style immediately, and she led the team to a miraculous turnaround from 2013 to the program's first trip to the District 3 tournament since 2011 in just three seasons. Rice is the Public Opinion field hockey Coach of the Year. The Blue Devils finished 9-9 and at .500 for a second consecutive season for the first time since 2011. G-A was also the only area team to make it to the postseason, performing in its first district playoff game since 2011, but fell 8-0 to 2015 state champion, Twin Valley. "I have a bit of a tough love philosophy," Rice said. "I expect them to work hard and I run a tight ship in my practice. I think the first thing we needed to do was to get the girls to buy into the program. They've done a great job working as team." Rice said this year in particular was a perfect storm of talent and leadership, which has carried through from her first two seasons as head coach. When she took over for Jen Everetts after 2013, Rice implemented summer workouts and extra activities in the offseason to begin the year-round field hockey mentality. Summer camps, club teams, winter workouts and cabin weekends fill up Greencastle's time in the offseason. 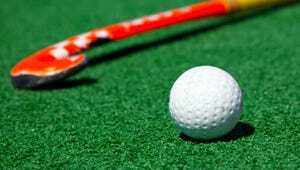 "I think the biggest thing is the dedication level, which gives us the chance to prove that field hockey is a serious sport," Rice said. "We were concerned because volleyball and soccer are very successful here and we were afraid we would lose girls, but the dedication to this field hockey program is there." While Rice was tasked with turning the program around, she had a bit of help. She credits the 2017 senior class for helping her get the program to where it needs to be to be sustainable and successful. "I have to give a lot of credit to our eight seniors," Rice said. "From the very beginning, their dedication caught on to the expectation, and I told them they are going to be the reason why when we are successful. It started with them, and they were the ones who put in time and the effort. "Freshman, sophomores and juniors are now coming to winter workouts, and coming to the club team practices. They know they're going to have big shoes to fill, and they know it's an open field for all positions and I think that has motivated the girls."